"I am going through my parents old pictures and scanning them in, so as not to lose history. 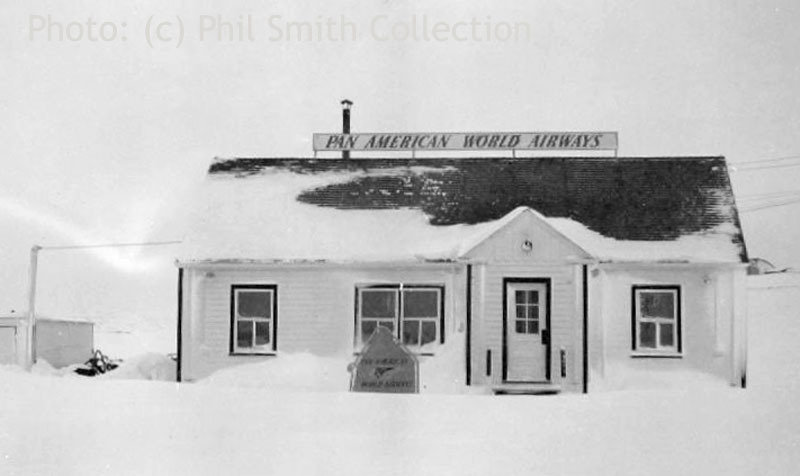 My father, Clyde J.Smith, was station manager of Pan American World Airways in Nome,AK from 1945-46; after this he went to Seattle, eventually to San Francisco. 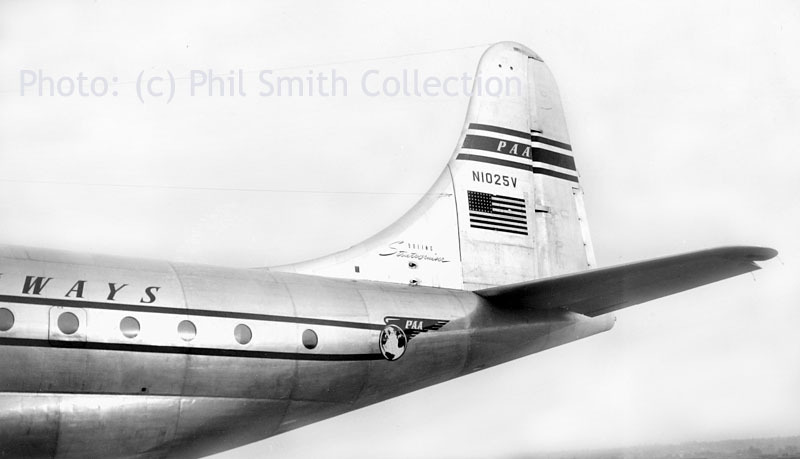 When Pan Am went to New York, he stayed in the Bay Area and went to work for Lockheed." The photos show the aircraft and conditions people lived and worked in, during an era one rarely see photos of. 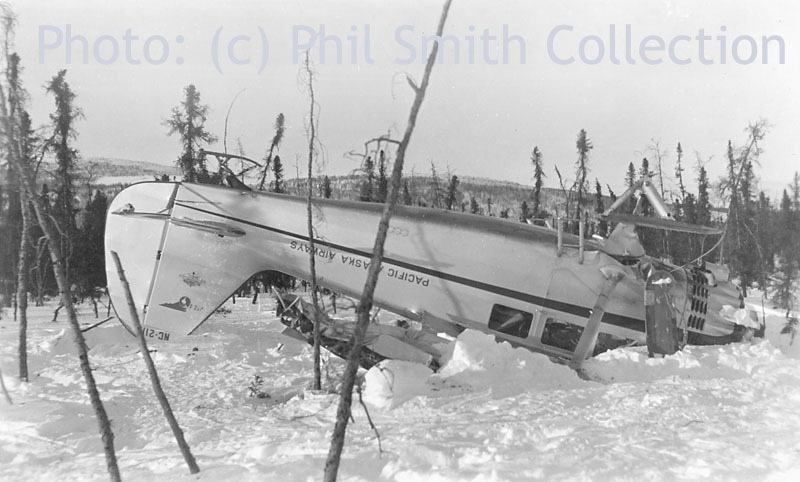 "Originally my father worked at Pollack Flight Services before PAA, no idea when that started but I've got a few wild pics of crashes way out in the wild. 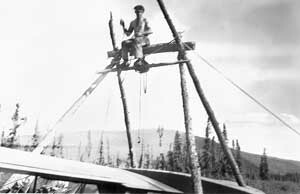 I know for one they got in by dog sled, made rigging from trees to pull the motor, salvaged what they could and brought it out in a raft! Wild times I guess..."
"Here are a few of the Boeing 377. 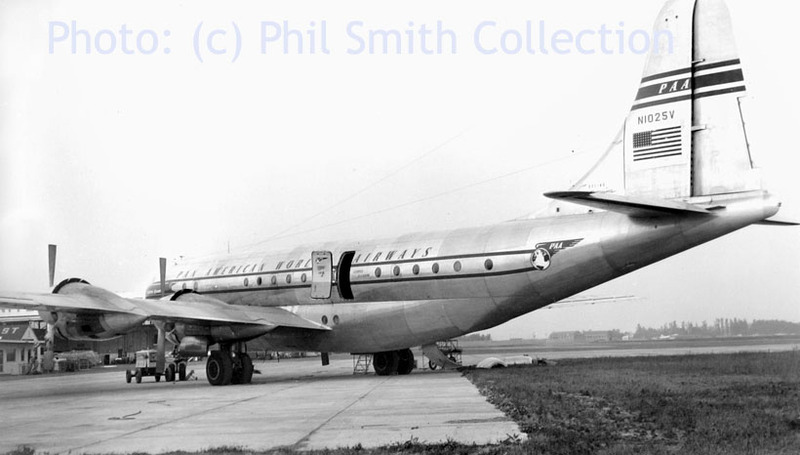 The tailnumber N0125V (c/n 15925) indicate this one became somewhat famous, they actually have a model of it after the name was changed. Thess photos were probably taken at Seattle, WA. Hope you enjoy these, the 377 was my favorite airplane." "A bit of Boeing 377 trivia. 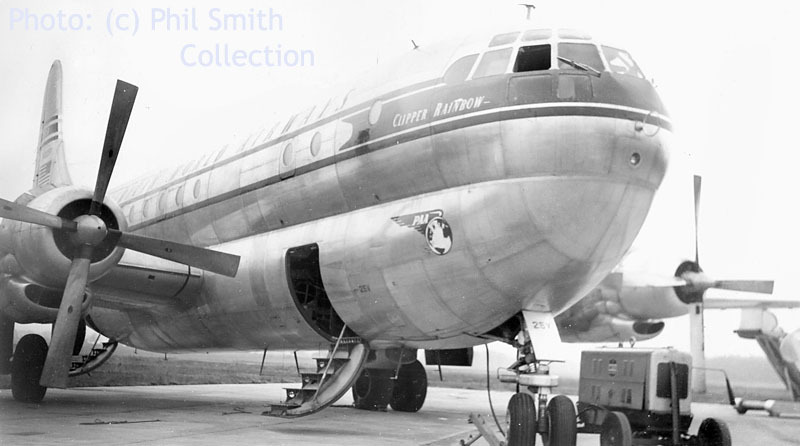 During 1956-57 I had my first trip from SFO to LAX (DC-6B) to see Disneyland. I was 7 or 8 years old. On the return trip we were deadheading on a Stratocruiser and I was very familiar with the cockpit etc as I spent many a weekend at the SFO base, playing in the planes. Somewhere between LAX and SFO we went up to the cockpit and they put me in the copilot's seat. This went on for a few minutes which seemed like hours! The pilot came back and asked if it was OK to take over again. I had not moved an eyebrow! 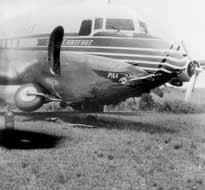 I figured the plane was flying and as long as I touched nothing it would be OK.
Wasn't until 1959 in Hawaii I found out I wasn't really flying. That wouldn't happen today!" 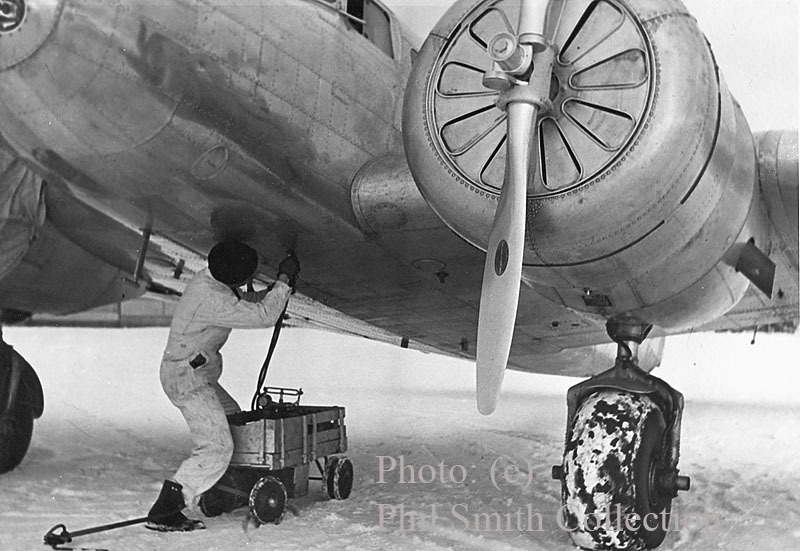 This Lockheed L.18 Lodestar NC33663 has c/n 2078, which Phil Smith thought could be taken at Nome,Alaska. 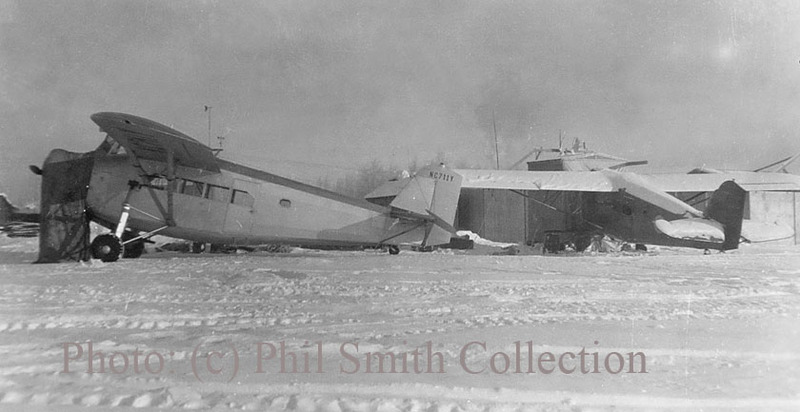 Delivered as NC33663 to Pan American A/W (Alaskan Div) on 18Feb41. 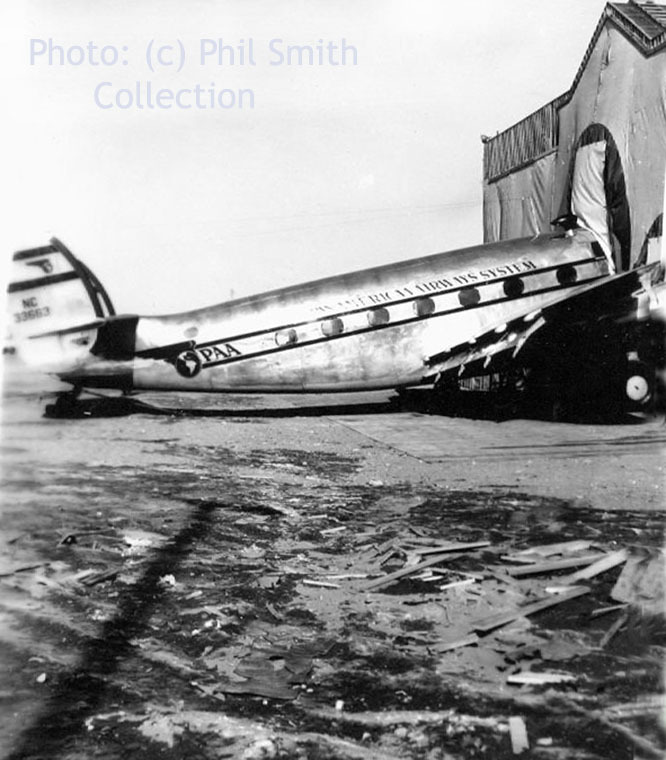 It was operated by Pacicfic Alaska Airways until transferred to the US Navy, where its identity became 99094; it was damaged when it collided on 31Dec44 with fellow US Navy Lodestar 99095 (c/n2079, L.18 NC33664 of Pacific Alaska Airways), but reinstated on 28Feb45. 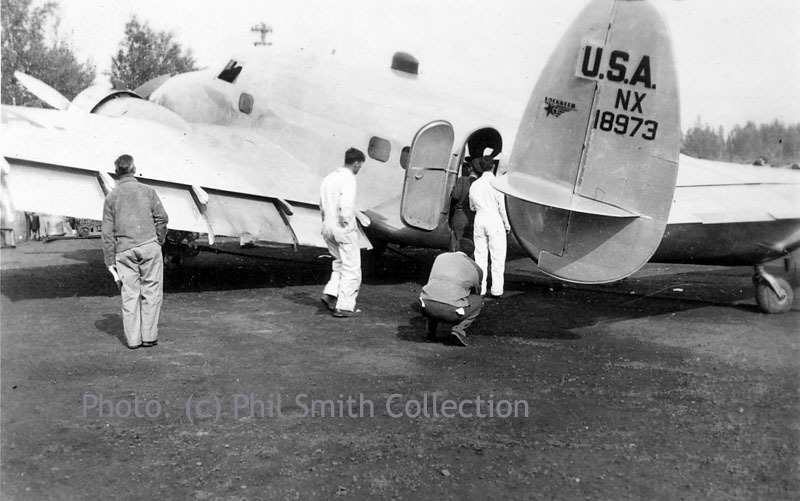 It went to CASU-7 Feb45, to Seattle and San Diego in April 1945, continued to Columbus in May45, Anacostia Nov45, Corpus Christi Feb46 and Quonset Point Jun46. On 30Jun47 it was declared "without further use"... I assume it was scrapped. "I saw you had some old S-43 pictures, well, here's another." The back of the photo has the following information: "One of the PAA Sikorsky S-43's which flew for awhile between Seattle and Juneau. Hope for the service has not been abandoned by Alaskans, who feel that it would be the greatest transportation benefit the Territory could possibly ask for." Pan American used 3 different aircraft types on its trans-pacific services in the 1930s. 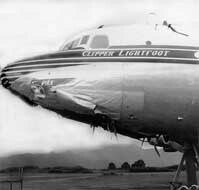 The first Clipper flight took place in a Martin M-130. 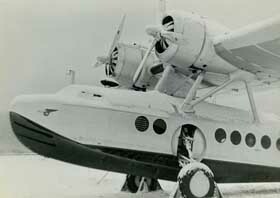 It used a Sikorsky S-42 to fly the Pacific survey flights and later operated them on the Manilla - Hong Kong route. 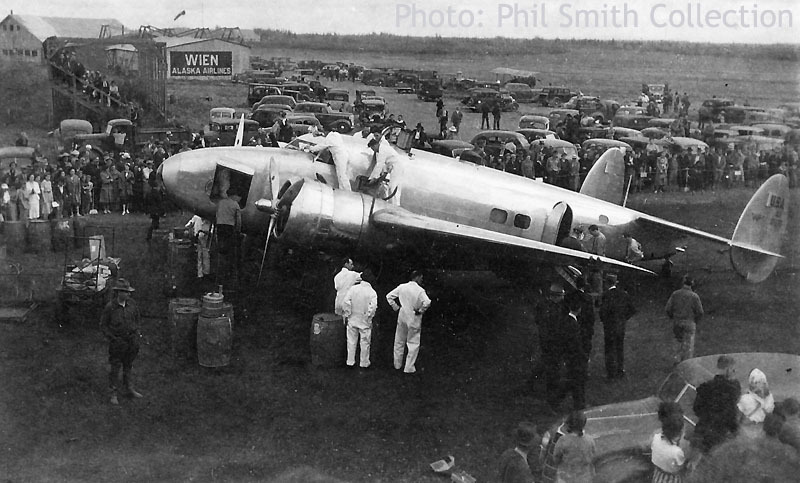 The largest was the Boeing 314, which was also the most luxurious and was introduced in 1939. 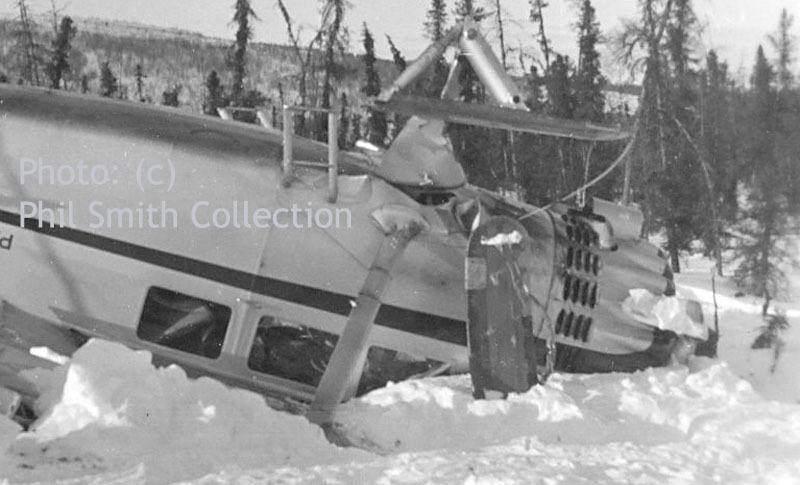 NC211 (for correct tailnumber, read on) of Pacific Alaskan Airways seen in a crash "probably near Fairbanks, during late-1930s or early-1940s, details unknown." Also I am uncertain in establishing the type of aircraft... 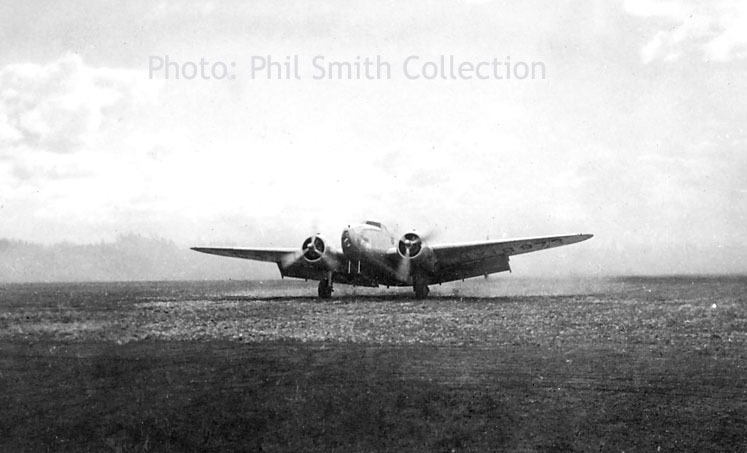 I found reference of NC211 being a Fairchild M-62A but that is a different aircraft, although the time would come close: 1941 to 1946 (and a North American SNJ wore NC211 in 1947, a Beechcraft BE-18 did 1947-1948..
My best bet, looking to some distinct features of the engine, would be a Stinson SR-5 Reliant; see one at the Boeing Museum of Flight. 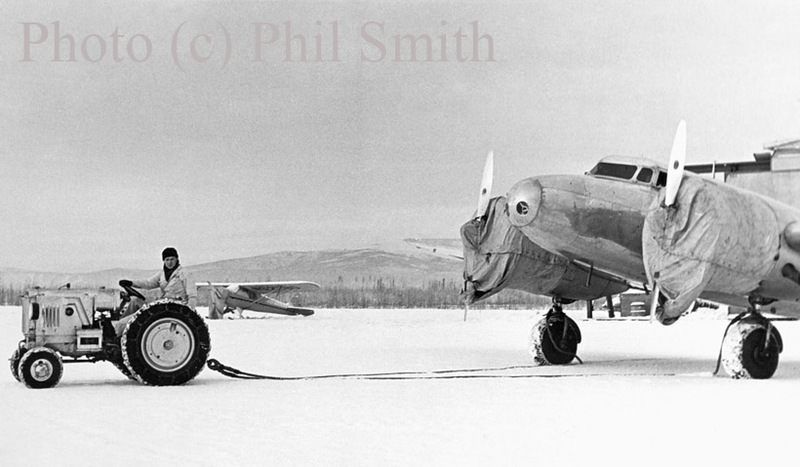 Bill Bailey came up with the correct tailnumber: "Phil Smiths' NC 211 is a Stinson SR-10F and the full registration was NC 21111. There is a picture of it on floats in Vol.7 Of Jos.P. Juptners US Civil Aircraft Series (page 295)." 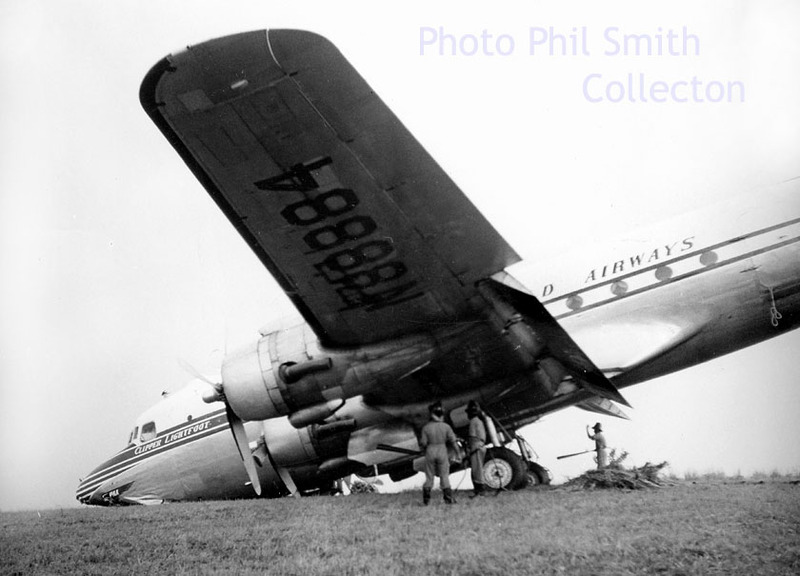 Pacific Alaska Airways became the Alaska Division of Pan American Airways in 1941. 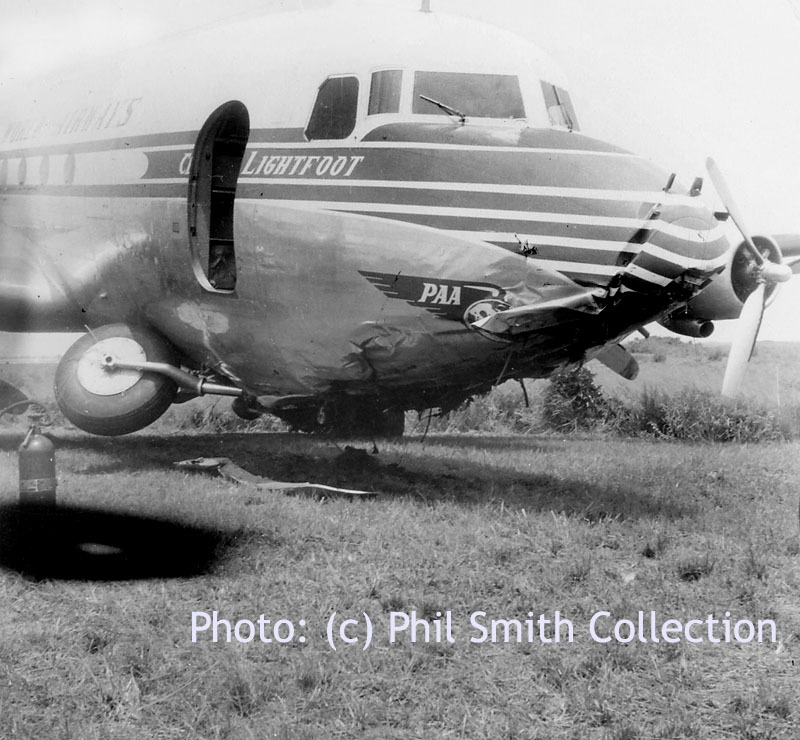 I would welcome more details of this crash or what became of NC21111: it was salvaged, as we can see on the photo below. 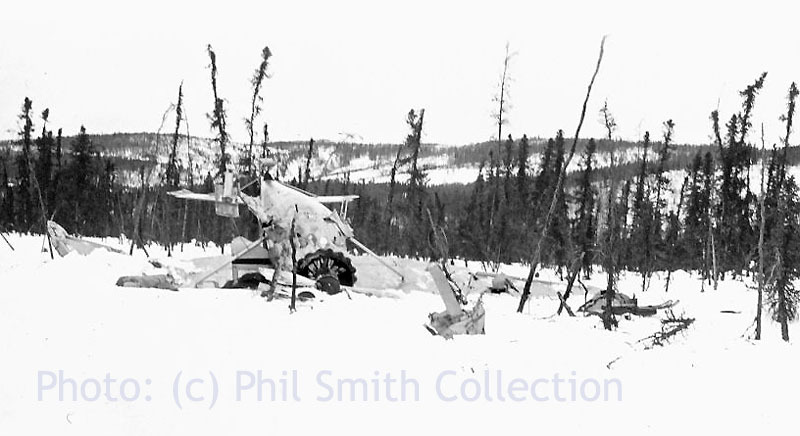 The crash scene of NC211; near Fairbanks? NC211 salvaged: where to ? What became of it? "In the Alaska State Library Digital Archives are two boxes of typed index cards titled 'Juneau Historical Files - Subjects, 1890's-1950s', which were compiled by a man named Captain Lloyd H. Bayers. Apparently he collected information from newspapers, word of mouth and goodness knows where to compile a very thorough record of historical tidbits! "3/27/1939 Pac. 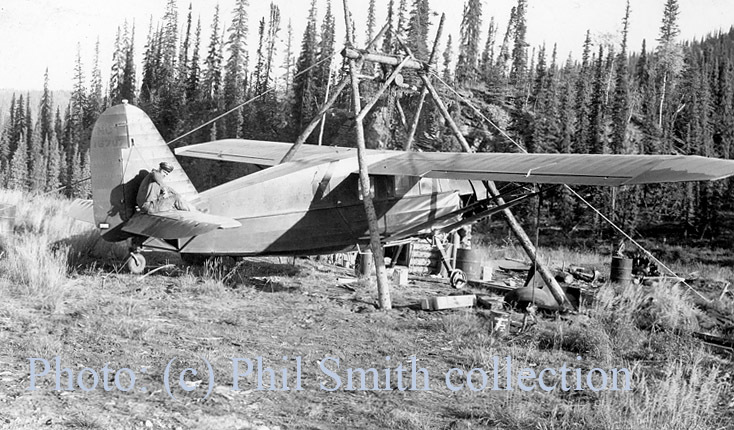 Alaska Airways $28,000 Stinson plane, pilot Ralph Savory, cracked up at Talketna (Takotna) with pass. Charlie Goldstein and B.F. Kane. All unhurt! 3/29/1939 Charles Goldstein tells of plane crackup here. Turned over and badly damaged. Wings broken off, etc." From the photos on your webpage, this is an accurate description of the wreck. 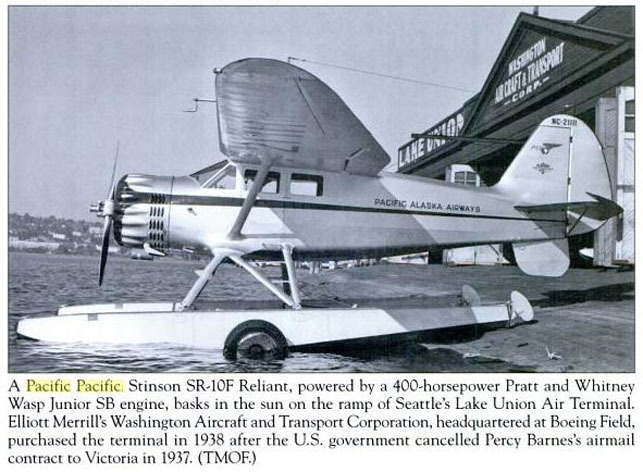 Also, as Pacific Alaska Airways only owned one Stinson Reliant (see fleet list at: http://aerobernie.ae.funpic.de/Pacific%20Alaska.html ), I am sure this must be the same aircraft described on the index card! 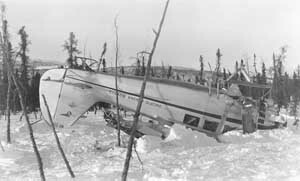 Ralph W. Savory was a well-known pilot for Pacific Alaska/Pan American. An excellent biography is in his obituary at: http://www.legacy.com/obituaries/pressdemocrat/obituary.aspx?n=ralph-walter-savoryπd=139612807 . ...which erroneously lists it as a SR-10J. 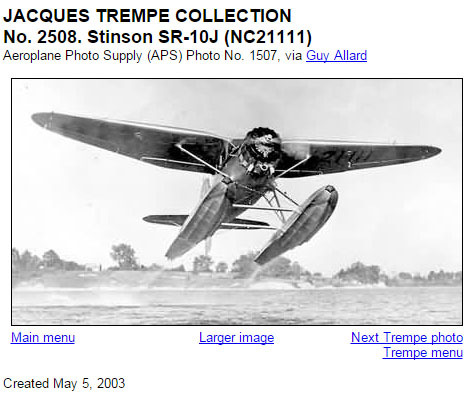 The Aerofiles Stinson registry reads "21111 Stinson SR-10FM ? ? SR-10 ? Alaska; unverified c/n". Other sites show the c/n unknown as well. http://members.shaw.ca/flightlines/smg_sr10f.htm says it is a SR-10FM as well. http://www.airhistory.org.uk/gy/reg_N60.html shows it as a SR-10F. Hope this information is of some use to you!" N88884 in an awkward position. 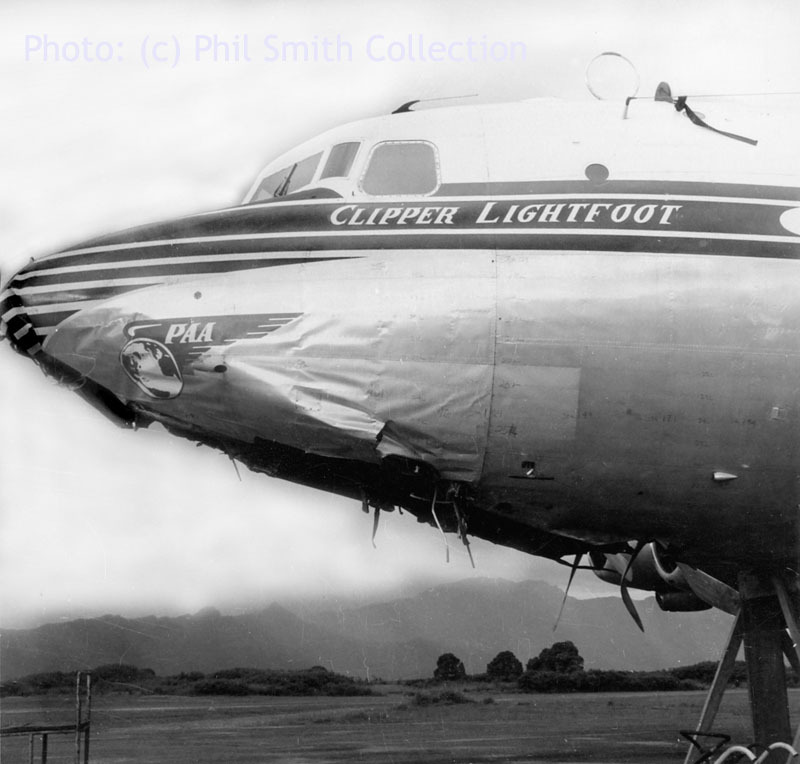 "Clipper Lightfoot" landed short of the runway in Fiji in early-mid 1950s. 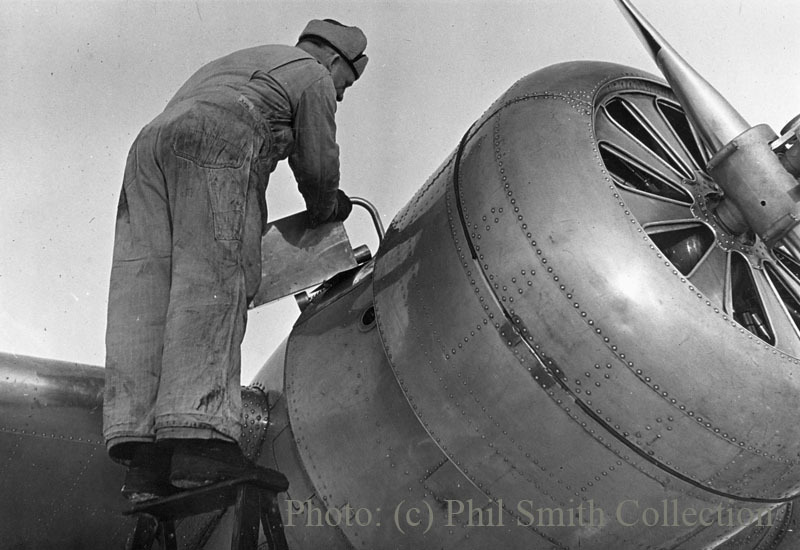 Phil wrote: "My dad went out to re-certify the plane, to fly it back to SFO to get it really fixed". My father was station manager here from 1945-46. These photos were taken in late-1945." "My father was Clyde J. Smith. 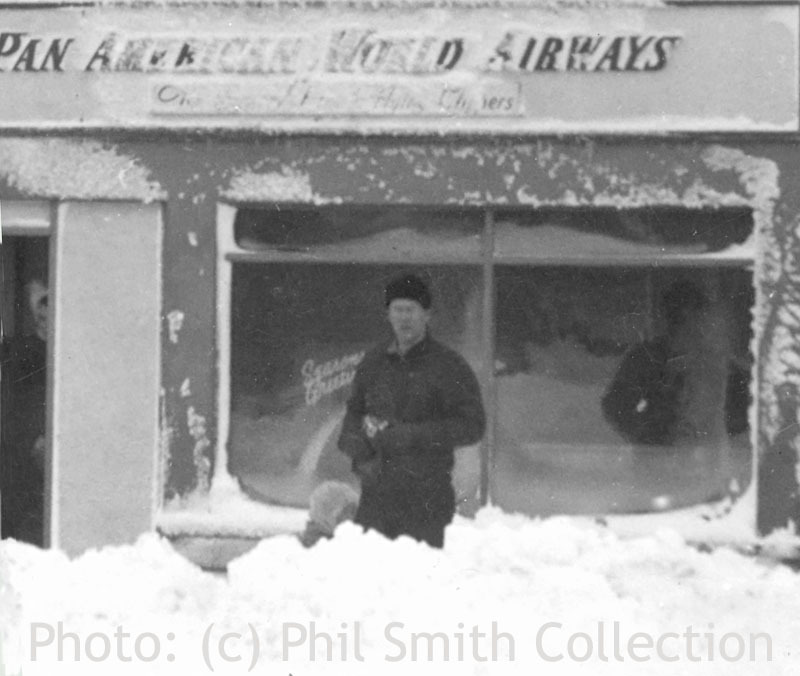 I assume that the above photos were taken in late 1945 because when I magnified the guy in front of the "downtown Nome office" you see Seasons Greetings in the window. I enlarged the scan to see if that guy is my Dad, and I think he is. 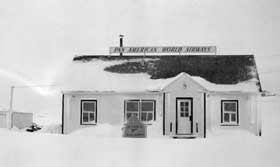 Something trivial, but nice to share: the 3 toilets in Nome... they were next to the theater which probably had a men's and women's so I assume the apartment next door shared the plumbing ( just a guess...)." "The PAA guys received a trophy for service; note the woman reaching down to hold the world, on top of the trophy - or that could be a bowling league trophy...? My dad is on the left. 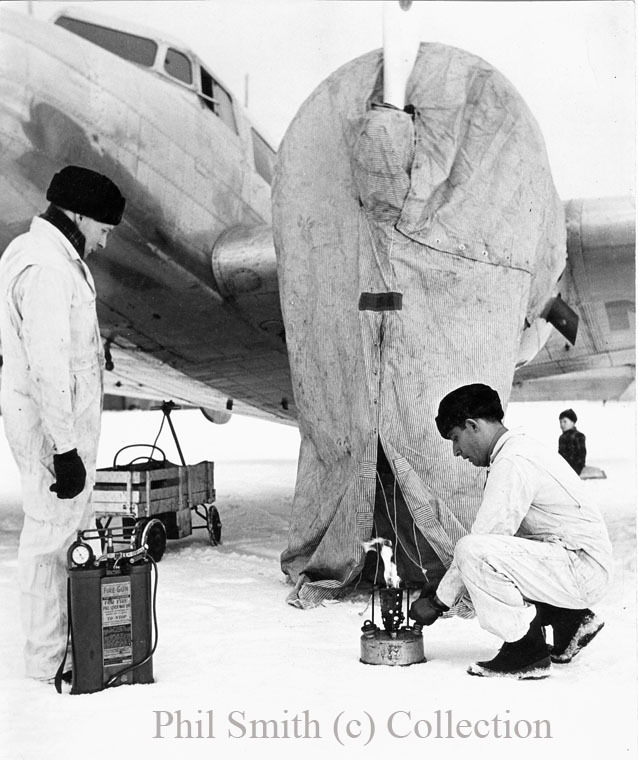 Left to right no.5 is Ray Robinson, who is the other guy with my dad in those pictures where they have a firepot under a plane engine to warm it up." 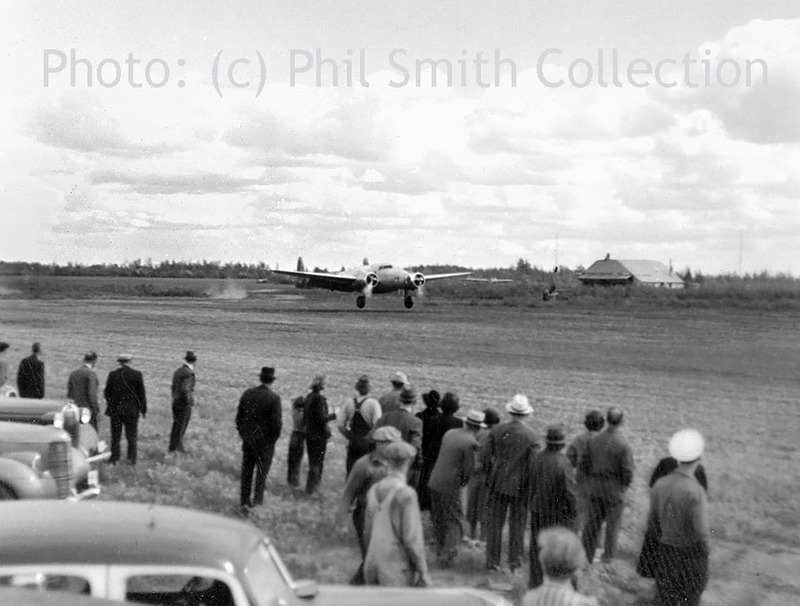 Phil Smith sent me these vintage pictures, of Howard Hughes arriving in his Lockheed L.14 Super Electra at Fairbanks,Alaska in 1938. The tailnumber is clear on one of these photos: NX18973. On this photos, if you look closely, the wheels are just about to touch down. 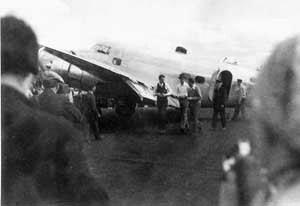 Phil wrote: "Check the tail number, it is him; Howard Hughes! My Dad worked for PAA (Pan Am) in Fairbanks, starting in 1938. 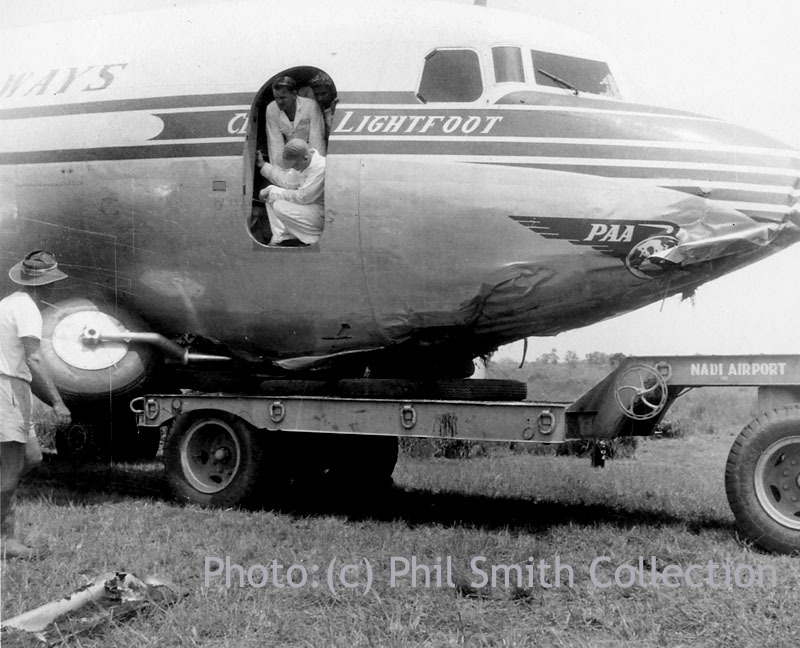 Hughes' plane was stuffed with ping pong balls for flotation and when Dad opened a cargo door some fell out... He was putting them back in and Hughes started yelling at him saying not to take any samples!" 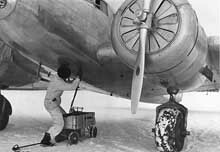 I found this on Wikipedia.org: "Howard Hughes flew a Super Electra (NX18973) on a global circumnavigation flight. With four crewmates (Harry Connor, copilot and navigator; Tom Thurlow, navigator; Richard Stoddart, radio operator; and Ed Lund, flight engineer), the plane took off from Floyd Bennett Field in New York on July 10, 1938. The flight, which circled the narrower northern latitudes, passed through Paris, Moscow, Omsk, Yakutsk, Fairbanks, Alaska, and Minneapolis, before returning to New York on July 14. The total distance flown was 14,672 mi (23,612 km)." "...recently was watching 'Modern Marvels: Howard Hughes Tech' on the History Channel - they showed the plane, starting take off and final landing, with map references showing the path of the flight and even had the tidbit about the ping pong balls with some added info!! 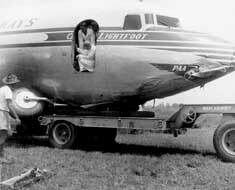 They were in the fuselage and wings and there were 80 pounds of them..."
Pilgrim NC711Y was one of Harold Gillam's Pilgrims. 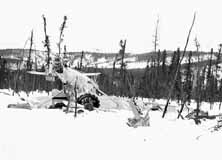 Harold Gillam was one of Alaska most notorious bush pilots and celebrated aviation pioneers. 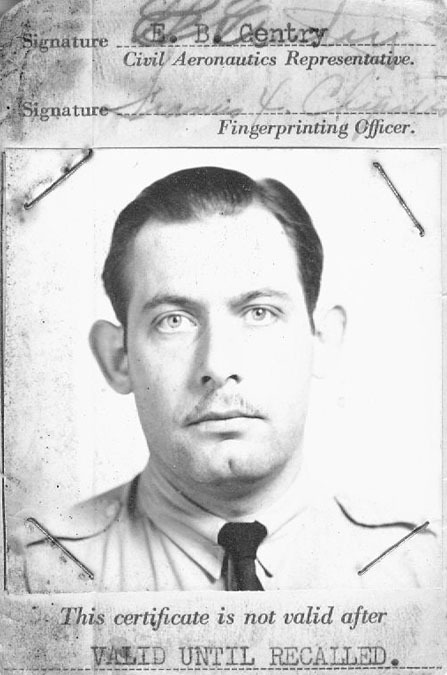 He went missing on a flight from Seattle to Ketchikan on 05Jan1943. More can be read about him on a page dedicated to Lars Opland's collection. 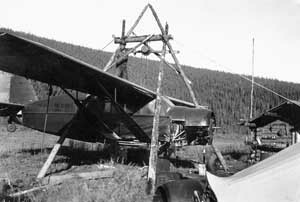 I haven't yet been able to find a good online article on this bushplane, but one can see the cabin would allow for a lot volume to be stowed in there. Phil wrote: "I'm not sure of the order of these pictures but the two guys are Ray Robinson on the left and my Dad on the right. I would guess they tow it out, hook up external power, heat the engines, prime them(?) and then start them. I noticed the slats were closed while the engine is running but a later picture shows them open. 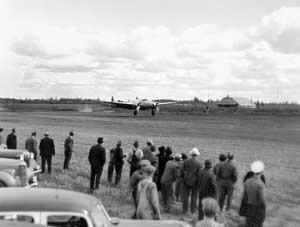 These were probably taken during 1946-47 in Fairbanks, although it could be from 1938 to about 1945. 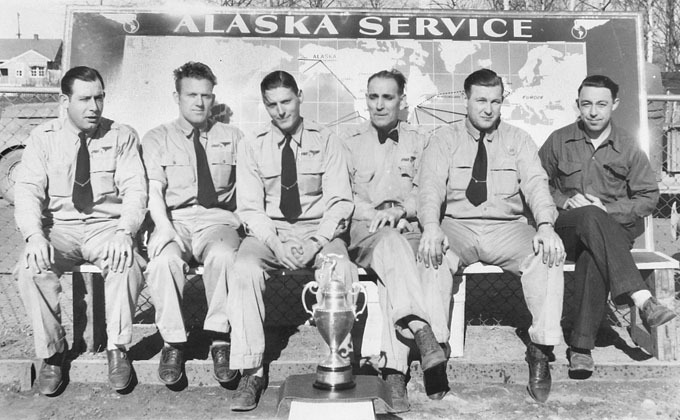 Dad started with PAA in 1938 and went to Nome in June of '45 for about a year or so then back to Fairbanks and then Seattle around late '47." A photo had the following text: "The lighted firepot is shoved under the insulated motor cover and the cover is laced. The rising heat from the firepot is circulated through the motor. 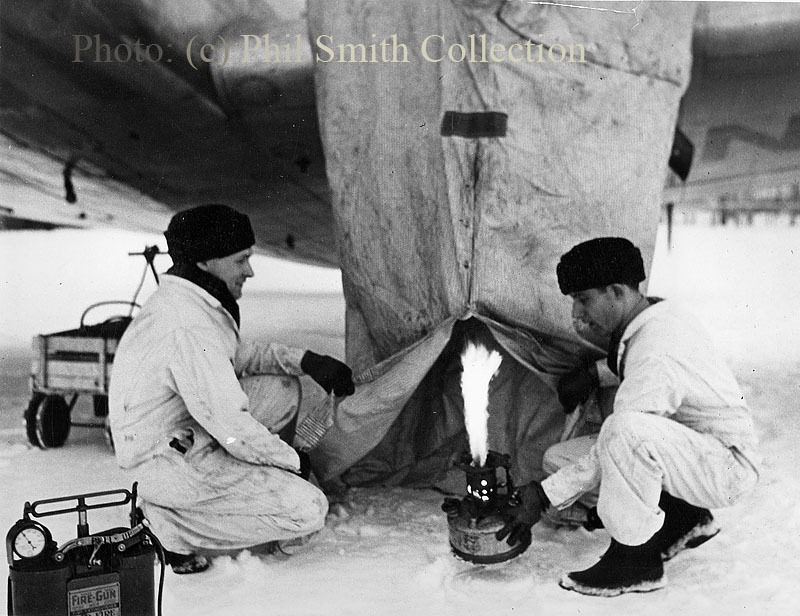 For two and a half hours in 50 F below weather, Ray and Clyde have to watch the proceedings carefully, for fear a taxiing ship's slipstream or a sudden gust of wind might blow the motor covers into the flame. Many Northern ships have been burned up in this way. Note the fire extinguisher is constantly at hand." Oil is being poured into the engine. While I don't see heat rising from it, I wouldn't be surprised if this was pre-heated. These photos were taken by Keith T. Petrich, as a stamp on the back of a print indicates. 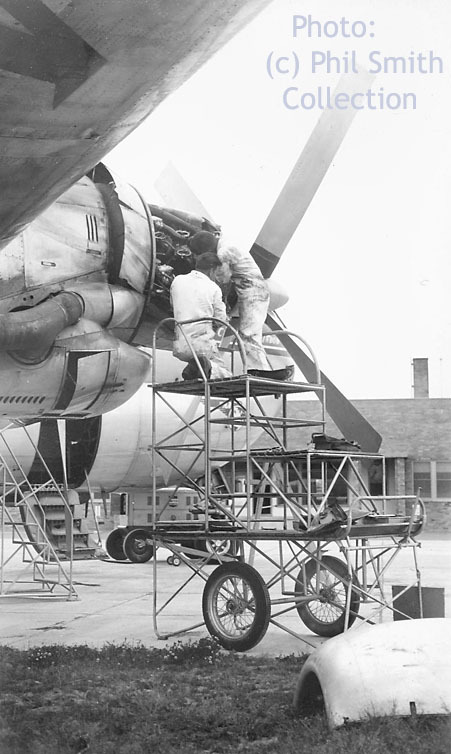 In the mornings, it sometimes took an hour or so to preheat each engine. 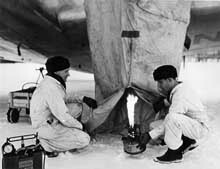 With a blow pot under the engine and a tent-like canopy over the top to trap the heat, the danger of a fire was always present. When it was considered warm enough to try a start, we would pull away the blow pot and canopy, and quickly start the engine, run it about 10 minutes, then shut it down and put the canopy back over. The heat generated in the cylinders would gradually spread through the engine accessoires and we could safely start it again in another 10-15 minutes and warm the engine up slowly, allowing the oil to warm for lubrication. And a nice book it is too! I can make out the tailnumber (NC)16707 and the titles on the aircraft read: "Pollack Flying Service of Alaska". 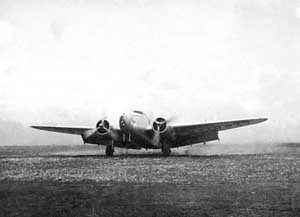 According to Aerofiles.com, this is a 31-42 Pacemaker Senior 1935 (ATC 578, 2-509), which is the same as the 31-40 with motor modification. POP: 4; two in civil use [NC20Y, NC16707], one each to Canada [CF-ANX] and Norway [LN-ABO]. Yes, this photo clearly shows 'NC16707'; as one can see the damage is quite extensive, but obviously not hopeless. Phil wrote: "Going through my dad's old pictures, I found these. He started with Pan Am in 1938, but was with Pollack before that, not sure how long." Phil: "I found a few of these and am not sure but I think they may be the photos of a poster being taken. Do you ever recall a PAA Alaska poster with a plane, dogs & sled and girl? Let me know if you remember such a poster." The Pilgrim wears the tailnumber NC737N and titles: "Pacific Alaska Airways". 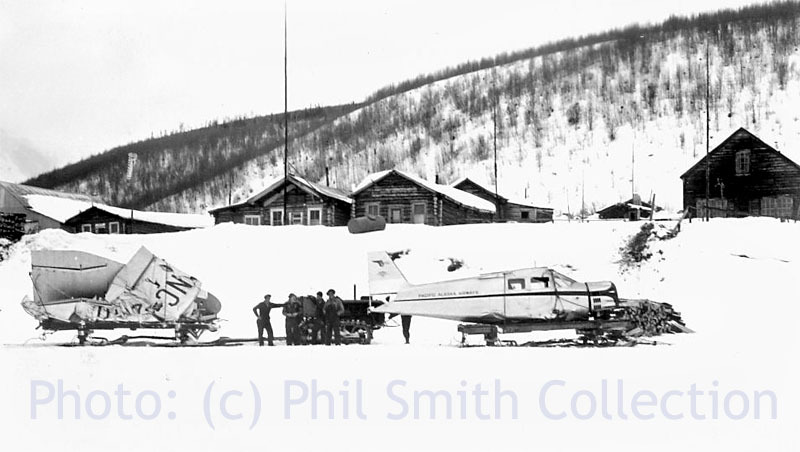 I noticed this Pilgrim NC737N was also shown on Ed Coates website: Pilgrim 100-B NC737N c/n 6701), operated by the Alaska Division of Pan American Airways in the 1940s. 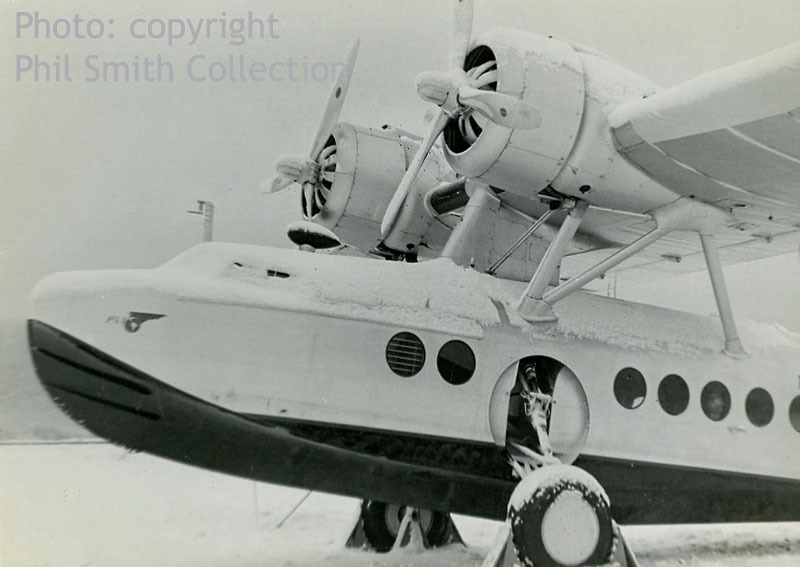 But his photograph must have been taken some time after May 1941, when Pacific Alaska lost its autonomy and became the Alaska Division of Pan American Airways.